For those with an interest in watching and potentially betting on competitive professional table tennis, there isn't a great deal of opportunity. For a sport that so many people enjoy playing in basements, with friends, and even competitively, it's quite surprising that there isn't more television focus on the professional level. In fact, outside of China (where the sport has more of a public following), most people's only real chance to watch competitive table tennis is during the Summer Olympics every four years. Somewhat surprisingly, though (for those who haven't tried), table tennis can actually be a very entertaining sport to watch, and particularly to bet on. Matches are played with incredibly high energy and intensity, and it's nearly impossible to watch a match without gaining a respect for the competitors. And as with any sport or competition, this is one aspect of what makes betting on table tennis enjoyable. A high-energy competition is always even more fun when you have something on the line! Additionally, there is more to betting on a competitive table tennis match than simply choosing the winner. Although, that is of course a popular option, as well as the easiest option for a spectator who might be new to the sport. 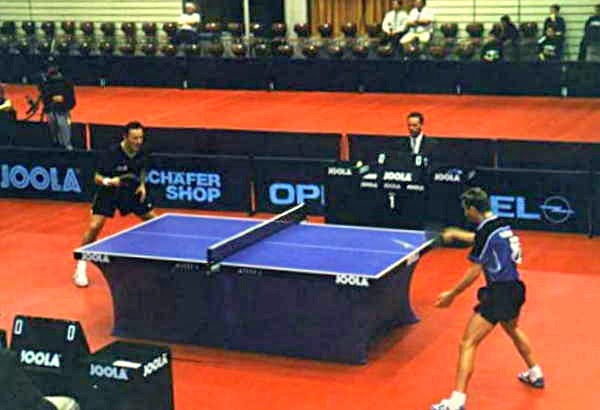 However, as explained in a table tennis article published by Gambling.com, there is an additional element to betting in this particular sport that keeps things interesting and unique for spectators: taking the over/under on how many match points will be played in a given match. For those unfamiliar with sports betting in general, the over/under simply refers to a number set by the oddsmakers for a given result. So, for example, in a baseball game the over/under might refer to how many total runs will be scored in a game, or even what the margin of victory for a given team will be. You then place a bet based on whether you think the actual number will be over or under the oddsmakers' pre-game estimate. And in a set of odds for a competitive table tennis match, the over/under generally refers to how many match points will be played. Not only does this provide spectators with a fun second option for betting (rather than simply who will win), but it is also an interesting option in that it specifically caters to closely contested matches. In a table tennis match with a clear favorite, the number of match points will generally be easier to predict, because it is expected that the superior player will take care of his or her match points with relative ease. In a close match, however, the number of match points will often be both higher and more difficult to predict, which provides a thrilling element to the strategy and consideration of placing a bet. All in all, the betting element can offer extra incentive to give table tennis another chance the next time you find an opportunity to watch it. Many dismiss it as a "game" rather than a "sport," and again, its limited television exposure doesn't help. But the talent is real, the matches are thrilling, and by putting a little bit of personal risk into the experience, you may find a whole new sport to enjoy! Really I agree with you, Betting improves the thrill into Table Tennis game. Your article is very informative and useful to know more about the Table Tennis betting. If anyone interested to bet legally in the USA, bet-legal-usa is the best for you.